The Hobbytech BXR.MT is a new 1/10th XL Monster Truck platform of unparalleled power on the market! This kits comes with battery and charger. 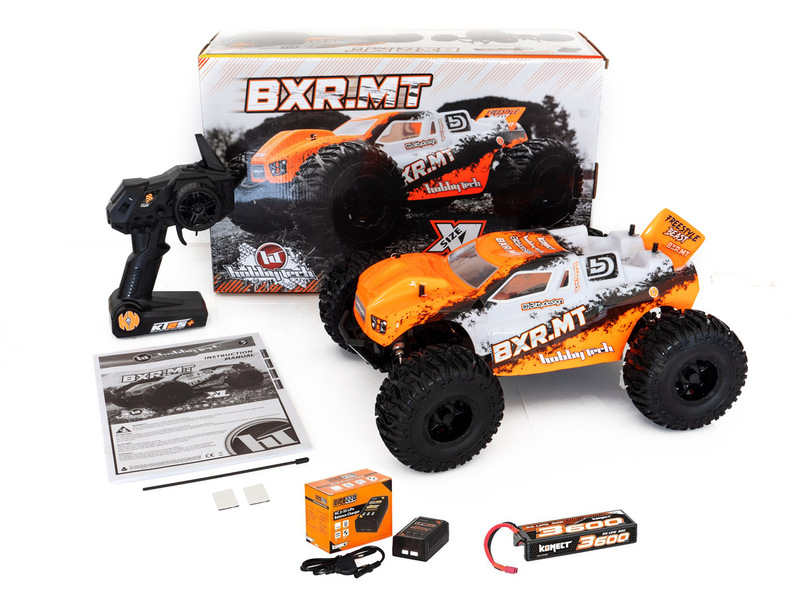 The BXR.MT is a new 1 / 10th XL Monster Truck platform of unparalleled power on the market! WARNING: This vehicle is a power monster! Front and rear wishbones, aluminum front and rear shocks, aluminum gearboxes reinforcements, aluminium reinforcing bar support, all mounted on new 132 x 57mm Monster tires. Out of the box the vehicle comes with metal gear front and rear diffs and an adjustable center slipper, big bore aluminum shocks and front CVDs complete a transmission made of steel joints fitted with ball bearings. An aluminum chassis and side protections allow the vehicle to withstand all race conditions. Powered by a 50Amp waterproof ESC and a 3500kv brushless motor for maximum power and peak speed.